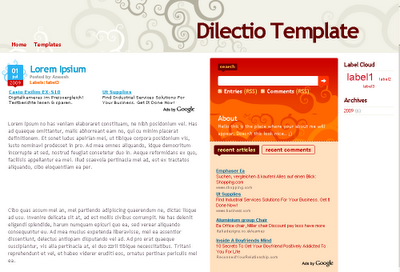 Dilectio is one of the free blogger templates designed by Design Disease(for wordpress) and ported to Blogger templates by BlogandWeb(Blogger template converter). This theme has got a very colorful interface and nice colors..
7. Integrated social Bookmarking icons like that of stumble digg etc..
How to install this blogger template? 3. After obtaining these 2 ids, you can start filling in the template generator. 6. A template will be generated for you will all the tweaks modded into it so that you don’t need to worry about modifying the codes.. This is my second experiment with blogger templates .If you like this please do let me know. If this stuff is helpful to you, I will soon tweak more and more templates for you. @vinoth thanks for letting me know.. i had mis splet the demo url.. corrected it now.. Cool template! It's very neat and simple. But it's quite hard to install. :D Thanks for sharing!